Kurt Brown’s family has been going to Leech Lake, Minnesota since the 1930s when Kurt’s grandparents started staying at Sunset View Resort, near Brevik. His grandfather eventually built a cabin near Sunset View. Later that cabin became part of Carlson’s Resort, and the family continued to rent it for many years. As a young boy in the 1960s, Kurt remembers many resorts near Brevik. These included Jensen’s Cabins, Pikedale, Twin Port Resort, Bear Island View, Lein’s, Sunset View Resort (Kurt states that this one may have had the best beach on the lake), Carlson’s Resort (this one was near his grandfather’s cabin), Safe Harbor, and Chippewa Lodge. Today four of these are still operating—Carlson’s, Chippewa, Huddle’s, and Pikedale. Over the years, Kurt has been collecting old maps and postcards of the early resorts near Brevik. My sincere thanks goes to him for contributing 32 of these images to my website’s “Shared Photos” section (click here to view the 32 images, and/or view a slideshow of these images below). 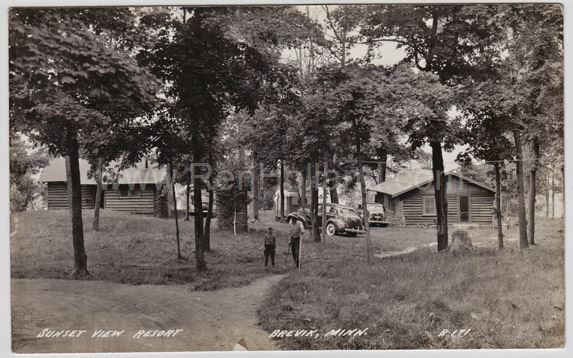 Of note, in the photo of Carlson’s Resort, the cabin built by his grandfather is the one on the right. This entry was posted in All blog entries, Minnesota Resorts, Readers' Stories. Bookmark the permalink. Another very nice collection and blog, Ren. It has been such a pleasure to follow the history, especially because the family is so important to me, and I have learned so much about the area from you. Thanks once again for another chapter!